This article is part four of a four-part series on the future of quantification in history. For the thematic introduction to the series, please click here. Or click on the following links for part one, part two, or part three. Kaplunk, kaplunk, kaplunk. It’s that sound, familiar to any Banished player, announcing low resources, or villager deaths. The sound that keeps you attentive to your village’s “vital statistics” – the resource stockpiles and citizen head count – like a surgeon monitoring the vital stats of a patient on the operating table, with a distracted eye. Like a surgeon, you know you’ve got to stay calm, and focused on the task at hand. 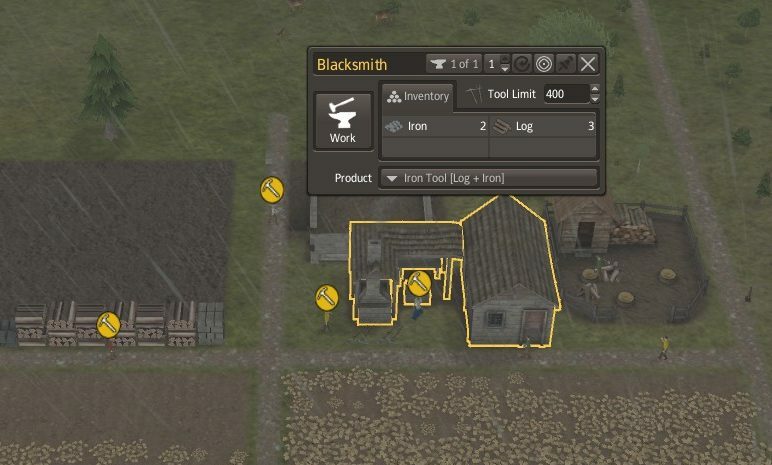 In Banished, this means effectively building up your colony and allocating your labour pool to various specialized production tasks – agriculture, mining, forestry, or manufactured goods. But you can’t let your attention drift away too long from your village’s vital stats. Let any of your stockpiled resources fall too low, and you may soon end up getting swallowed down into a spiral of negative collateral effects. Food is a fairly straightforward affair: if the stockpile grows thin, your villagers will begin to starve, and die off. Ditto for firewood, or basic clothing : can’t keep your villagers warm? Once winter rolls around, see how many of them make it to spring. But what about less straightforward indicators? For example, the lack of tools? Once those little yellow tool icons start popping up above your villagers’ heads, it’s only a matter of time that they’ll become unable to go about their tasks. That’s your whole village economy that’s about to grind to a halt, all because you didn’t foresee the timely arrival of iron ore and wood into your resource stockpiles, or didn’t have a village forge running properly. Keeping a good reserve of tools therefore also means keeping a constant eye on iron extraction, and making sure there’s lots of wood coming in for both home heating and tool making. And then there’s that fluctuating birth-to-death ratio, pressing you to constantly re-allocate your narrow labour pool. Wondering why so many people are dying off, and too few births to compensate? That one took me a few dead villages to figure out. Basically, you must build new homes adjusted to your population growth. Build too few homes, and the families will bunch up together, not letting young couples do what comes natural, and bring little ones into the world. Build too many homes, and you’ll have people living in them alone, with the same dismal result. Add to this the freeing up of individual “home slots” whenever an aging worker passes, and you’ve got a population puzzle that requires constant monitoring, and tweaking. 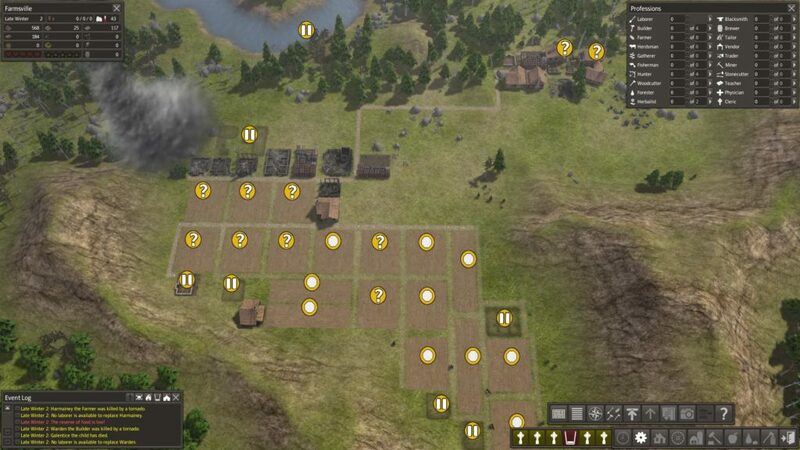 Initially a one-man development effort, Banished has, since its release in 2014, established itself as a perennial favourite in the niche market of city-building simulations, attracting a loyal fan base and a lively community of modders in its wake. The version of Banished I will be reviewing in this article is a full-fledged expansion of the game, the Colonial Charter mod. Colonial Charter builds on the basic game with a full gamut of village buildings and trade specializations that expand on the game’s quasi-historical frontier colonization theme. That said, if the Colonial Charter mod adds a rich variety of economic specializations to choose from, it does leave the game’s core mechanics unaltered. The basic premise of Banished is simple: fail to produce a surplus of basic goods and resources, and the viability of your village will be threatened. In the wake a declining stockpiles, your population will succumb to various woes – mostly huger, cold and ill-health – and start to die off. Sometimes you can pull through and start to build up your population again. But there is also a good chance you may never recover from a drastic population drop. 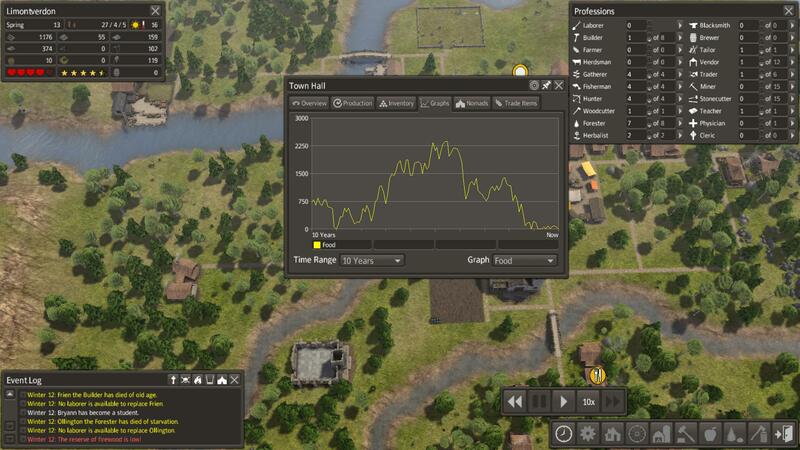 Survival in Banished thus hinges on controlling production as best as the player can, to ensure there is enough of a surplus in vital product categories such food, tools, and fuel. Just how much of a surplus – and of what kind of goods – depends in turn on the player’s village design, map type, game difficulty, and population growth/village expansion patterns. Easier said than done. Plan your village all you want, before you know it, you’re laying waste to the environment around the settlement just so your villagers can keep producing and reproducing through the winter. And how do you get over that potential village-breaking disaster? For one, you can’t let villagers stray too far away from home to gather resources, and set up lousy supply chains or risk exposure. So you’ll have to find some cottage-industry method of extracting resources, whether a mine, a quarry, or woodcutter’s shed. You discover in the process that your adorable village settlement is now a hungry economic engine, swallowing up more than it can effectively churn out. If you haven’t built out too far in the wrong direction, it’s time for a redesign. So you build new homes in small clusters, near the centers of production and resource extraction – that way your workers don’t have to travel too far to work. You also build a marketplace, to centralize distribution in between residential and cottage industry hubs. Finally you build a town hall, to monitor all town inputs and outputs more effectively. Once you’ve got the engine of production working, it’s time to acquire what can’t be obtained from your immediate environment or production output, through trade. Thus, part of your production surplus is “liquidated” through simple barter transactions at a trading house, in exchange for new seeds, animals, and goods. If there is no money in Banished (or at least in the basic game), every good you’ve produced and stockpiled becomes a “money-form” (to quote Karl Marx) in the account books of the trading house, with a nominal value attached to it. Thus, mushrooms are worth one “unit of exchange”, while iron tools are worth eight. Accumulate a valuable and diverse set of goods in your trading house, and you’ll soon be able to bundle them together in a single transaction to equate the nominal value of herd animals, new crop seedlings or any other good not produced in your village. Thus, the problem of the surplus takes on a new dimension – commerce – nudging the player to optimize village inputs and outputs for surplus production, all the while ensuring that part of this surplus can allocated for market transactions to obtain new goods, or new production inputs. Be careful though: it’s easy to get overconfident with a huge surplus in a given category, only to find, in the event of a sudden downturn one has to urgently transfer goods from the trading house back into the town’s market or stockpile, in a desperate attempt to alleviate a crisis. Indeed, it doesn’t take much to tip the balance you’ve painstakingly set up – say, in favour of manufactured goods destined for trade – to the requirements of food production or resource extraction tied to population increases. Thus, even if you are micro-managing your labour pool and resource production limits effectively, the economic engine of Banished revolves around the classic problem of the surplus. Master the surplus, and you’ll be able to expand at a steady and relatively stable clip. Lose control of the surplus, and Banished changes from a city-builder to a survival management game. It’s really that cut and dry. 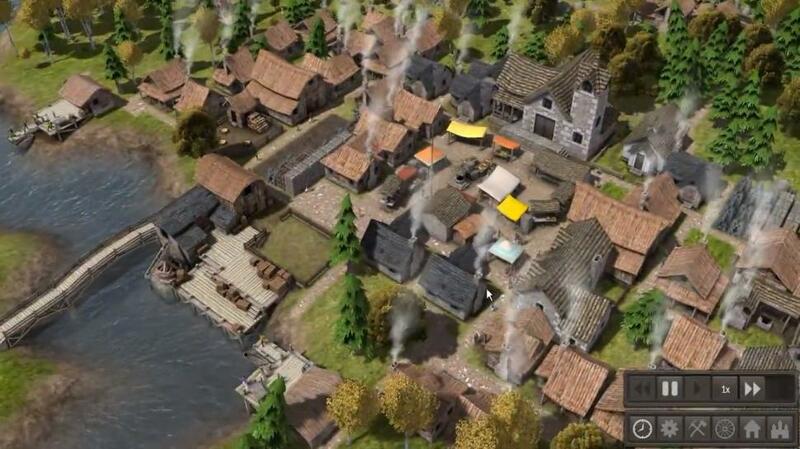 Lucky for us, Banished is considered to be both a city-builder and a survival sim. As I have already outlined, this is due to the design choice of simulating a small-scale economy of a settler society, in the city-builder genre. That Banished has a colonial setting is no mere coincidence, and I will analyze this thematic choice further down the road. For the moment being, I would like to focus my argument on the historical message carried by the simulation. The faceless villagers that live, work and die in your beautifully-crafted village hearken back to a prototypical situation that cuts across time and cultures, and yet is tied with the very idea of historical development: human settlement in a fixed geographic location. This theme of permanent settlement – and the production-based economies that gave rise to it – is often referred to by historians as “the backbone of civilization”, extending from the neolithic revolution right down to the present. And if history has given us plenty of narrative to embellish the tale, it has also unfortunately buried some of the more vexing issues of human settlement below the surface of historical awareness. 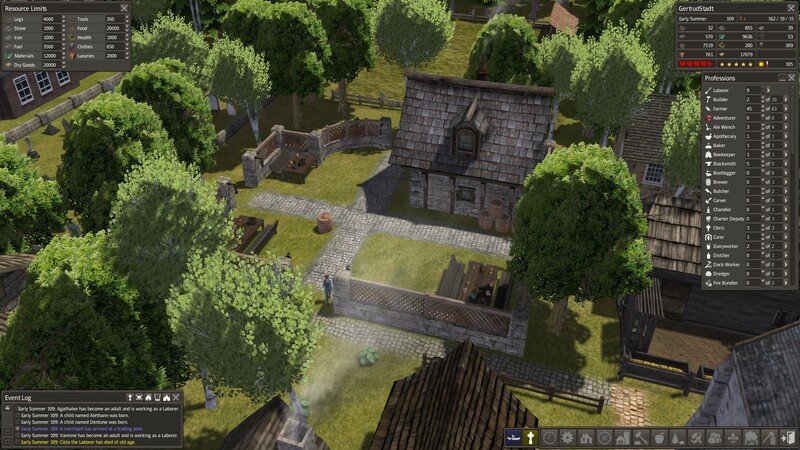 Enter Banished, a video game centered around the agonies and ecstasies of “designing” a functioning village economy, from a top-down perspective. 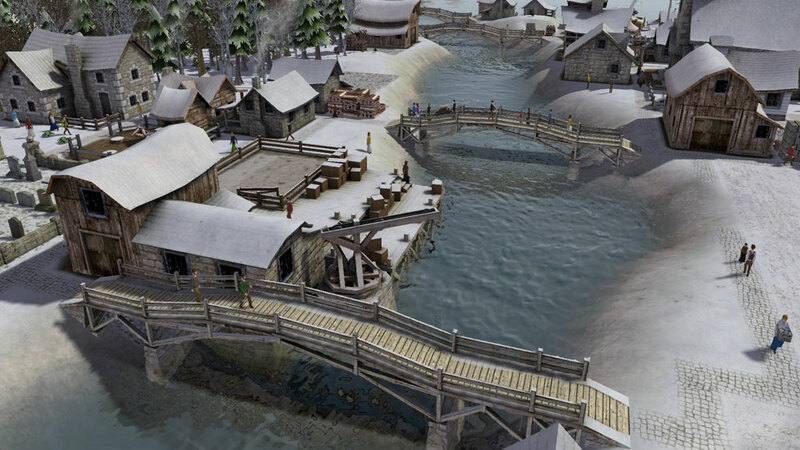 As a game, Banished is situated on the trajectory of the well fleshed-out niche of economic simulations that go under the name of “city-builders”. City-builders have a fascinating history of their own, and as a genre they tend to focus on the organization, optimization and scaling of simulated economies – or to put it more crudely, “production systems”, with their “inputs” and “outputs”. Ever since Will Wright defined the genre with his celebrated opus SimCity, city-builders have by and large remained open-ended “sandbox” economic simulations, with minor structural or thematic variations to differentiate each new contender in the field. But the fundamentals remain the same: in every city-builder game, once players succeed in laying down basic human settlement systems, the only thing left to do is to build out, and expand. Thus, because of their “build your own economic engine” focus, settlement simulations tend to have city themes and a bias for territorial expansion. 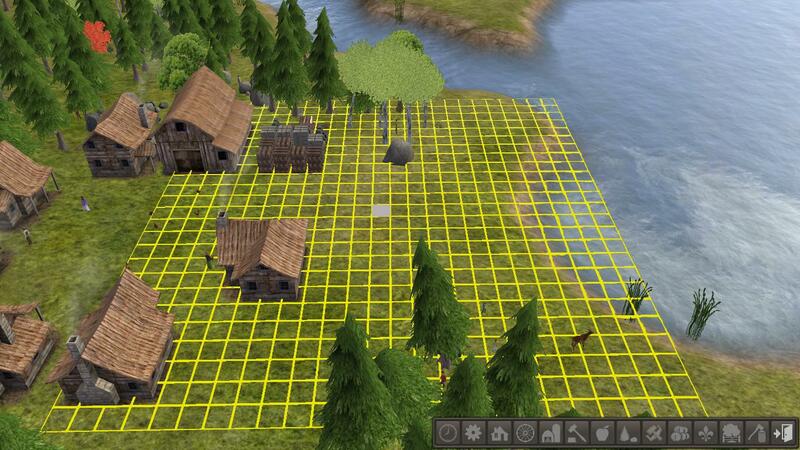 Banished is not the first smaller-scale settlement simulation. 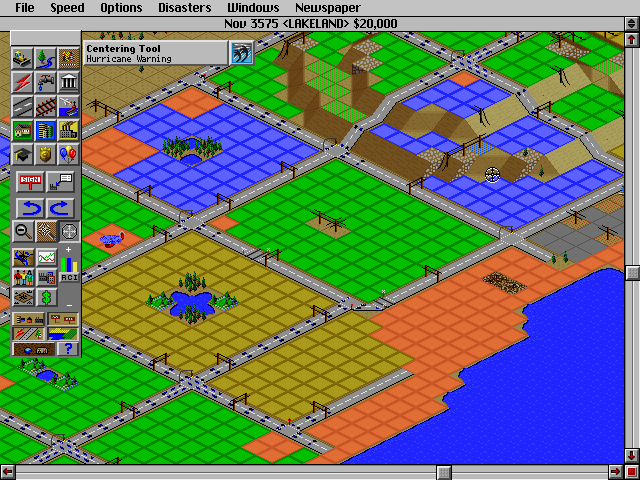 It too, follows the curve of the typical city-builder in encouraging system optimization, and “urban” expansion. But where it differs from others city-builders, is in its sharp focus on the problem of the surplus – the “survival” angle of the simulation. 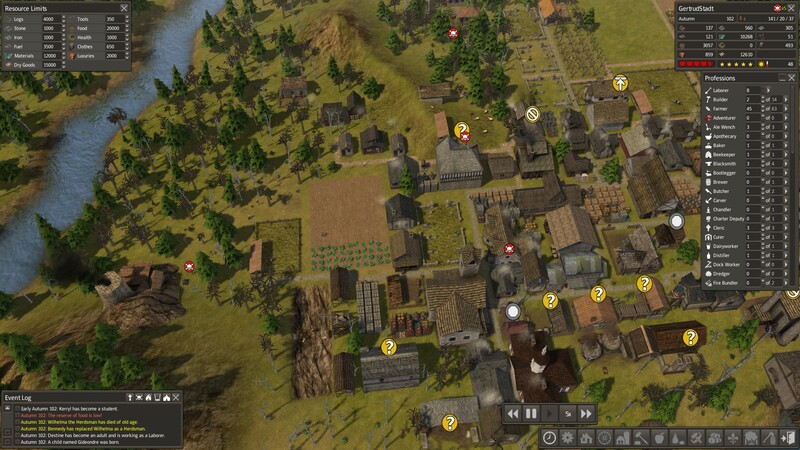 Indeed, the remarkable thing about Banished is that it manages to encapsulate, in game form, the Achilles’ heel of every settled human society: the production surplus. 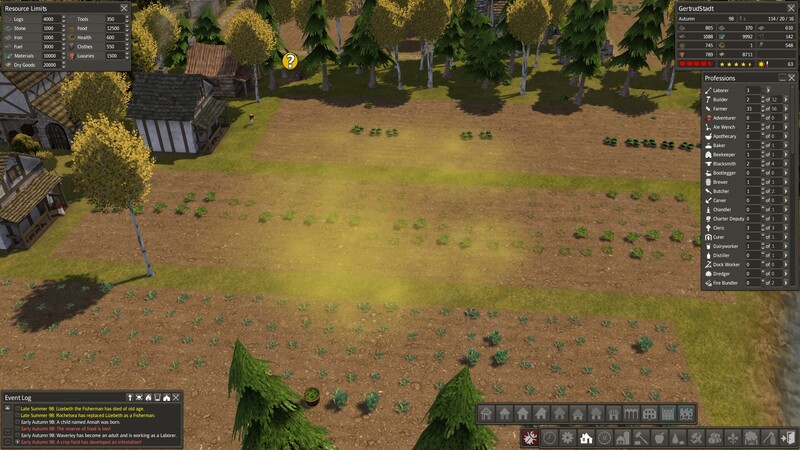 It is no accident that agricultural production and resource extraction play a central role in Banished, and that this focus on the economic roots of permanent settlements, in turn, draws players into the problem of the surplus. Banished thus simulates the prototypical survival situation of millions of anonymous village- and city-dwellers throughout history, from humanity’s first agricultural settlements to today’s bustling megalopolis, and their – indeed, our – dependency on surplus production. Because of its focus on the “survival” issues of permanent human settlements, Banished ups the ante of economic simulation to new levels of fidelity. Designing the simulation’s problem-space around the effects of production surpluses simplifies the game’s economic model, highlighting traits common to all production settlements, whatever the scale. 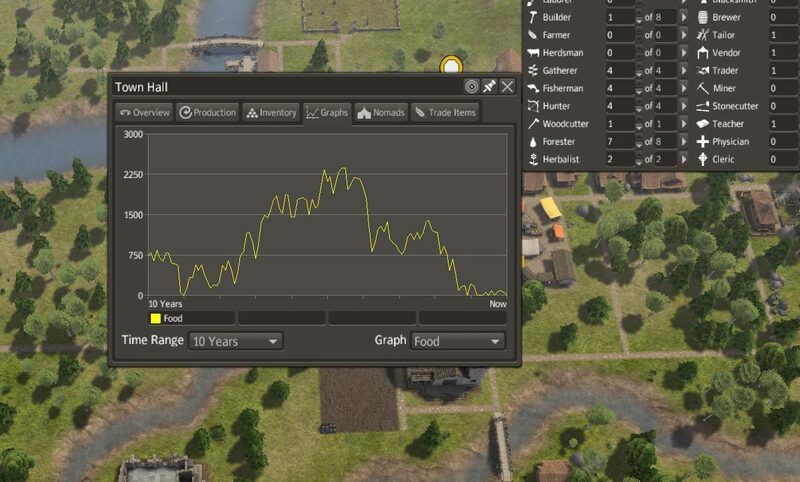 Indeed, Banished makes the case for production-based economies as ideal-types – as abstracted models sharing key characteristics – by demonstrating that agricultural surpluses are at the root of economic growth and decline. Thus, gone are the high-level administrative categories found in other city-builders, such as zoning, infrastructure or budget categories – all hallmarks of city life. Despite the complexity of its game systems and the rich offerings of Colonial Charter mod, Banished plays as a streamlined, integrated whole. 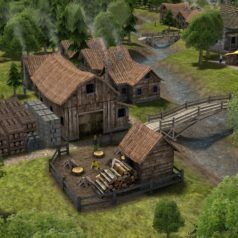 One key design decision for the game was to ensure that players focused on the villagers and their activities, and to make village expansion directly tied to population numbers. Ironically, this tight bounding of the player’s scope of action allows for greater creativity, compared to city-builders that give players carte blanche from the get go. In the end, if everything in Banished amounts to optimization of inputs and outputs, the game never comes across as a hyper-rationalized, top-down simulation of small-scale economies. “How did the state gradually get a handle on its subjects and environment? Suddenly, by processes as separate as the creation of permanent last names, the standardization of weight and measures, the establishment of cadastral surveys and population registers, the invention of freehold tenure, the standardization of language and legal discourse, the design of cities, and the organization of transportation seemed comprehensible as attempts at legibility and simplification. In each case, officials took exceptionally complex, illegible, and local social practices, such as land tenure customs and naming customs, and created a standard grid whereby it could be centrally recorded and monitored. Our modern world is, of course, fully-paved with such good (managerial) intentions. Indeed, we now take this once-radical epistemology so much for granted that the words and tools of our society’s coordinating classes completely permeate our lives. In this scheme of things, simulations can be seen as logical extensions of technocratic reason, where “seeing like a state” has become fully realized and naturalized, as a form of entertainment. That said, is there a meaningful distinction to be made between simulation, and the social engineering activities of the state and of businesses? I think there is. The essential distinction lies, in my view, in the “mirror-like” quality of simulations, or the way simulations attempt to represent a given natural or social “system” (a process that critics of social engineering call reification). If social engineering extends administrative legibility to every living creature or thing, simulation limits this impulse: it places the “actionable” portions of the simulation into a specific domain of legibility, and the rest of the simulation’s underlying systems into a “black box”… of game mechanics. Grid It, and They Will Come. This “black box” does not imply that the game mechanics of a simulation are necessarily invisible or inaccessible to the player. It means that the player’s synoptic view – or top-down grasp of the game’s systems, manifest in the control panel, or interface – is always limited in scope, by virtue of human cognitive capacity. Simply put, the human perceptual apparatus cannot fully grasp the complex and interacting sets of procedural systems churned out by computers – even if computer software is the product of human ingenuity and labour. Indeed, the whole history of user interface design, and human-computer interactions, is beset with this issue. But I don’t want to delve into this topic here. 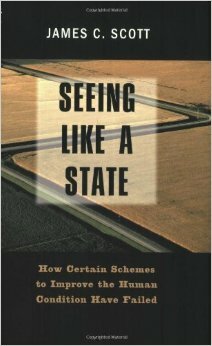 Rather, I simply want to point out, like my Play the Past forebears, that “seeing like a state” is the name of the game of all simulations. By definition, simulations offer problem-spaces for their users to interact with. In doing this, they must put the greater portion of their underlying systems into a “black box”, outside the immediate perception of users. This is a core design issue for all simulations: how do you design an interesting problem-space for players, and achieve some degree of fidelity with regards to real-world systems modeled by computers? The answer is: by keeping the majority of the game’s systems in the “invisible part of the iceberg” – beneath the threshold of player awareness. In the case of Banished, the “tip of the iceberg” portion of the simulation focuses the player’s attention around the problem of the economic surplus. To do this, the micro-economy “represented” in the game had to be stripped of texture and complexity, and simplified to yield measures and production units. The essence of seeing like a state. And so if Banished charms us with its bucolic visions of a settler village in colonial times – complete with smoke billows and wintry snowflakes – it also terrifies us with its single-minded focus on production and outputs, and its highly-abstracted reckoning of human effort, and life purpose. As a simulation, Banished carries with it all the pathologies of technocratic reason, simplifying life to a productivist symphony, in celebration of the many proliferating forms of pure function. A Blight on your fields, O ye townsfolk ! The last issue I want to address in this article is the value of Banished as an educational tool. In an earlier review of the game on Play the Past, educator Jeff Mummert pinpointed the strengths and weaknesses of Banished as a teaching tool, and its usefulness in demonstrating the “inner workings” of human settlements throughout history. Mummert also went on to suggest how certain game mods could be developed to provide more historical flavour to the game, as the Banished agrarian economy ideal-type can in principle be themed to different historical periods. If you’ve followed the discussion so far, you’ll probably agree with me that we need to be careful with conducting historical investigation through the distorting lens of simulation. Mummert does provide sufficient caution with regards to classroom use of the game, and so I simply want to spell out in more detail what he has already outlined. In a nutshell: what specific distortions does Banished introduce into our assessment of human survival, as a collective endeavour? 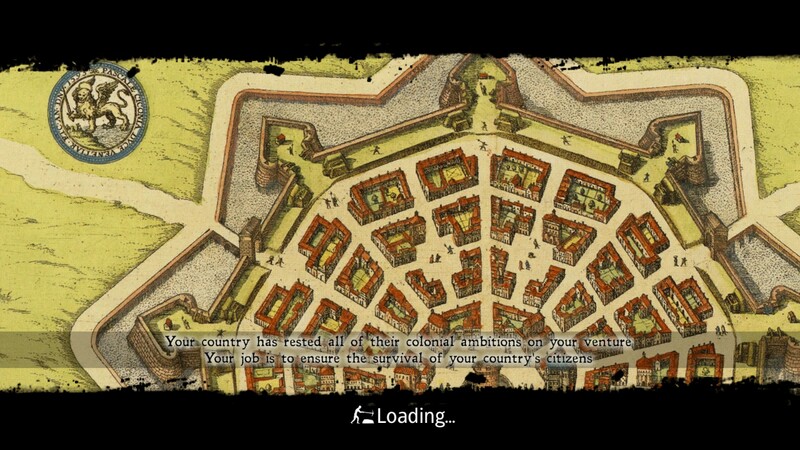 Once a town planner, now a loading screen. In truth, Banished is the simulation equivalent of Adam Smith, a systematic description of “natural economies” that is far more idealized – and ideological – than it cares to admit. For example, Smith’s myth of barter and the origins of money – still found in economics textbooks today – makes the case for money-less, yet strangely money-like, form of exchange “antecedent” to money, which, because of its incommodious quid pro quo quality, was eventually supplanted by currency in order to facilitate “natural” exchange. Banished does not make this model of barter a central game pillar – i.e. trade between villagers – but it does present a system of exchange that hearkens back to classical economics, at the micro-economical level of overall town production. Like economics theory, Banished naturalizes markets without direct reference to the state functions which, historically-speaking, made markets possible to begin with. 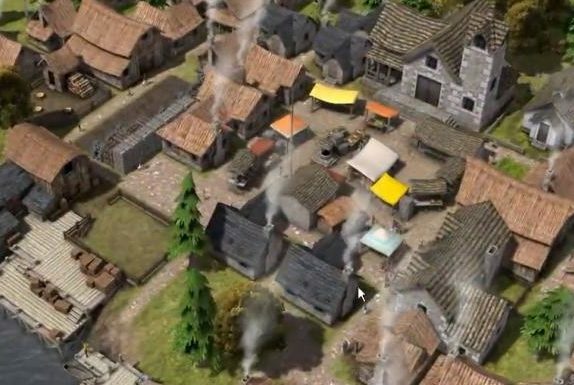 Ironically, retrofitting the Banished core game engine to an earlier agrarian civilization would require adding state functions such as taxation, policing, and even religion – something which Mummert also point to – all institutions that emerged in the wake of the neolithic revolution, over long periods of rural and urban development. And many ancient history-themed city-builders already do a fine job at this. With these caveats in mind, it is my contention that the colonial settlement theme of Banished is no accidental choice. At the cusp of modernity, colonial settlers arriving in the New World carried with them the accumulated knowledge of post-feudal land exploitation, town settlement, and the seeds of the integrated world market. The image of the New World these settlers gave us was, for the longest time, bereft of native populations – an issue which history textbooks have finally begun to notice. Rather, European settlers encountered the “virgin” land of the new world as a tabula rasa, primed for harnessing, and exploitation. The “lessons of the neolithic revolution” could thus, in the case of seventeenth- and eighteenth-century European settler societies, come neatly packaged into portable form, for endless extension. But European settlers, of all varieties and extractions? Without succumbing to controversy, let us at least take note of the affinities between the colonial settlers of Banished with the particular colonizing schemes of New Netherlands and New England. Spanish and Portuguese colonizers may indeed have opened the floodgates to New World riches by primitive exploitation. Overall though, they built very little independent productive capacity in the New World, aside from resource extraction and crop monoculture fueled by slave labour. Ditto for the French economy in the Caribbean – and even more so in New France, where utter dependence on the fur trade required countless live Indians to trade with. Rather, it appears that Banished has modeled for us the prototypical Dutch or English New World settlement, steadfast on virgin land and destined for economic autarky. A calvinist-derived New World, as it were. Ineffably, Banished delivers us this colonial-utopia package as a template to test our theories of settlement and production, away from the hot and bloody mess of early-modern imperialism. Perhaps in ultimate homage to the spirit of capitalism, Banished requires no overt state apparatus: taxes, armies, infrastructure projects and public services. 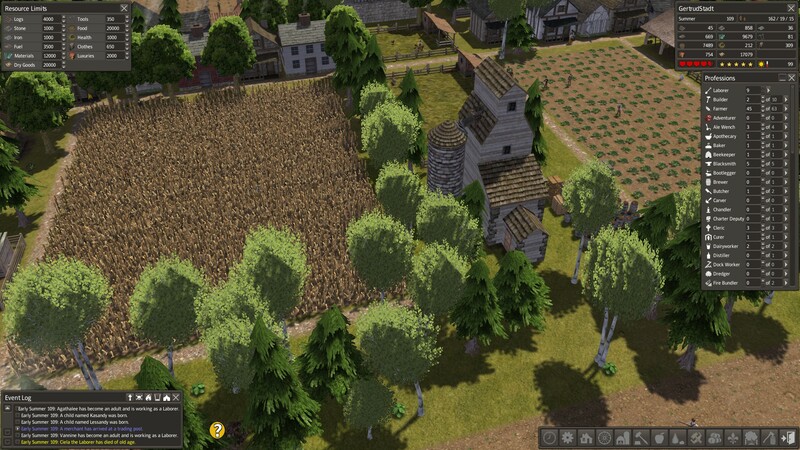 Banished allows us to see like a state, without the heavy impediments of a fully-realized state. The synoptic view of the omniscient administrator in the game is fully-transparent, and given over to the essentials of economic production. The Banished village experiment is thus akin to the utopian mirage of a free-flowing economy sans les accoutrements de l’État – a revolution long-heralded by market apologists, of all stripes and creeds. But deploy, allocate and recombine as you may, the rules that govern life and death in Prototype Village are painfully clear. In Banished, you must optimize and expand, or die – by extinction, or by drowning in surplus production. Achieve anything “less”, and you will push your little group of anonymous settlers to the brink of nameless extinction. Banished from the historical stage, as it were, into the dissolving horizon of Progress and Markets. You finished reading this! Hark, to the tavern! Scott, James C. Seeing like a state : how certain schemes to improve the human condition have failed. New Haven. Yale University Press, 1998, p. 2. For a full discussion of the myth of barter and the historical rise of states and markets, I refer you to David Graeber’s 2011 book Debt: the First 5000 years. Critics of the book often point to the piling up of anecdotal examples from anthropology that contradict economic theory, but fail in turn to address the gist of Graeber’s argument: economics as a science takes an abstracted – and often fictional – view of the historical record. The definitive theory on the marriage between Capitalism and Calvinism, comes from Max Weber, in his book The Protestant Ethic and the Spirit of Capitalism. Without the impediments of the State.